Off to Canada and was so hoping my downstairs neighbour's cherry would blossom before I went - and it did! By the time I'm back (mid-April) it will be busy making leaves instead and that's a pretty sight as well. Spring. We're lucky to have you! Three years ago, children’s author, Tommy Donbavand, was diagnosed with inoperable throat cancer. Since then, he has battled every day through the appalling side-effects of numerous treatments and the associated medical conditions they brought with them, desperate to keep going for the sake of his wife and two children. Last week, Tommy was given some terrible news. His cancer is back. There is nothing more that can be done. His oncologist has given him “weeks or months” to live. Tommy is one of life’s good guys. For years, he tirelessly worked to promote literacy in schools and libraries. Like most children’s authors, this provided the majority of his income, and being unable to run these events has drastically slashed his income. His most pressing concern now is how to best help his family once he is no longer around. It’s a terrifying, heartbreaking thing for most of us to even imagine, but for Tommy it’s the grim reality he is facing. This site was set up by a group of Tommy’s friends to help raise funds for him and his family. The love and respect for Tommy throughout the publishing industry is such that we’ve been able to assemble some truly incredible lots from some equally incredible people. Every penny raised through the auction will go to Tommy and his family. So, take a look through the listings. Many of them are one-of-a-kind items and experiences which cannot be found anywhere else. You could bag yourself a piece of history, end up in a book, or just grab some signed copies of titles from your favourite authors. And, more importantly, help a good man cope with a terrible situation. 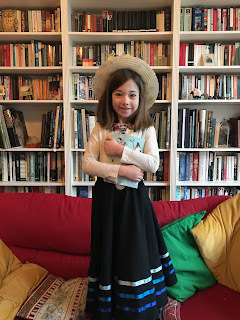 For World Book Day this year, Freya became Slightly Jones, with her detecting notebook at the ready! Fabulous! And the girl detective has her own website, called Slightly's Notebook.